Windows Movie Maker, the world famous video editing utility developed by Microsoft, works on Windows operating system with MSWMM project files formatted with WMV, WM, AVI, MP2, MPEG, MPG, etc. So that's the reason why you can't import Windows Movie Maker files to iMovie for further editing or transfer WMM files to your iPhone iPad Android and game consoles for playback. Yes, your troubles can get resolved via free online converter website. Serioursly, you do not think it's the best solution, do you? Because there is an even better solution for you to 100% safe and free convert Windows Movie Maker to MP4 at world's No.1 fast speed and greatest stability. That is the below commendable free WLMP to MP4 transcoder, which will enhance you user experience to a high level. You just can't miss it! Amazing Free Video Converter to Try Right Now! 1). 1-click to free decode WLMP to MP4 at 5X faster speed (GPU HW Accel). 2). High Quality Engine to keep output MP4 file with zero quality loss! 3). Transcode any video to MP4, H265, etc. 180+ video, 14+ audio formats. 4). Free video editor (trim/crop/rotate) & adjust resolution/bit rate/frame rate. 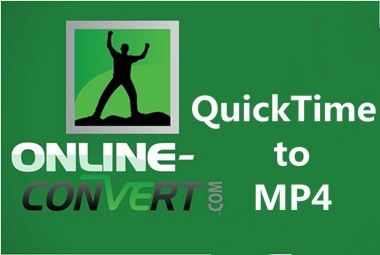 100% FREE convert WLMP to MP4, AVI to MP4, MP2 to MP4, MPEG to MP4, WMV to MP4, etc. on Mac/Windows PC at full speed (multi-core CPU utility). Adopt advanced De-interlacing tech and High Quality Engine to help you free change Windows Movie Maker video to MP4 without losing quality. Free transcode any videos like MKV to MP4, AVCHD to FLV, H265 to H264, YouTube to MP4, MP4 to MP3, etc. 180+ video & 14+ audio formats. Perform as a free video editor to trim/crop/rotate video, add SRT subtitles to video, adjust parameters (resolution, bit rate, frame rate, aspect ratio, etc.). Step 1: Load the Windows Movie Maker files after free downloading this high-end free video processing tool. As you can see, this free MP4 video converter supports batch video conversion. So you can import multiple Windows Movie Maker files for encoding to MP4 at one stroke. 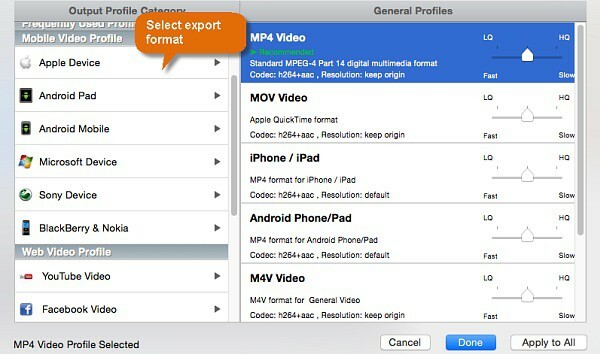 Step 2: Choose "MP4" as output file format from "General Profiles". 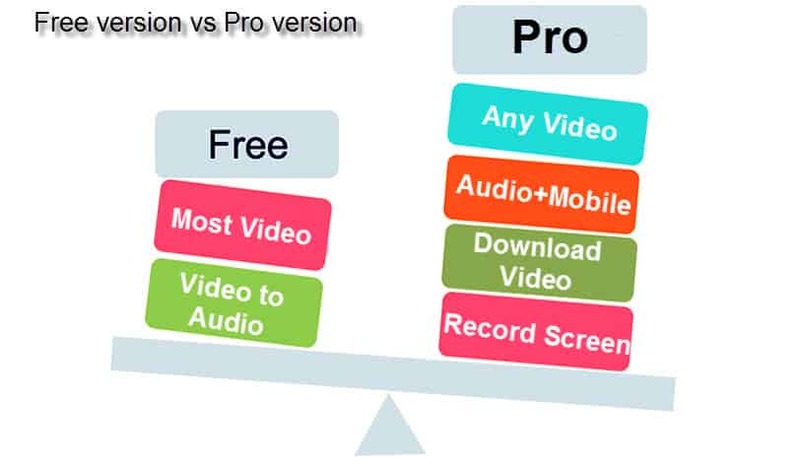 Or, you can choose MP4 (H264 or MPEG-4 codec) from Mobile Video Profile, including Apple Device, Android Pad, Android Mobile, Microsoft Device, etc. Plus, this free video converter is also a two-way solution for you to convert MP4 to other formats, for instance MP4 to WMV, MP4 to AVI, MP4 to DVD (PAL & NTSC), MP4 to FLV, MP4 to MKV, MP4 to MP3, MP4 to OGG, etc. 1. Tap the scissor-shaped icon to edit video if you need, including trim MP4 to free set the Start/End time, crop MP4 video to remove black bars, add SRT subtitles to MP4, rotate video 90/180/270 degrees, adjust volume, add watermark or text to customize video, etc. 2. Click "Settings" icon on the main window (next to the chosen output device icon) to adjust video resolution, frame rate, bit rate, change aspect ratio, audio channel, audio codec, sample rate, etc. 3. Switch button "Merge" to green on the right lower corner of the main interface and you can smoothly merge multiple video files into one. Step 3: Simply a light click on "RUN" button to start to convert Windows Movie Maker WLMP to MP4. Know more about WMV vs MP4. Generally, the free Windows Movie Maker file converter can meet your basic requirement to free change Windows Movie Maker to MP4, as well as MKV, MOV, AVI, etc. other video and audio formats. Yet, for those who want to own a versatile video converter, you're supposed to upgrade from free version to MacX Video Converter Pro version. You can see the main difference between free version and pro version. And honestly, that's not the whole story. Other features from Pro version are not listed all here. You can just free download the trail version of MacX Pro version to see what it gets. Unique video converter to support advanced Intel QSV hardware acceleration tech to speed up WLMP to MP4 conversion at 250-320 FPS, No.1 fast speed. FREE download video music from YouTube, Facebook, Vimeo, Dailymotion, Instagram, IMDB, etc. 1000+ video sharing sites. Record on-screen activities like record gameplay video, walkthrough video, tutorial video, etc. with crisp image and clear audio. Free life-time upgrade to the latest version and receive help from support team 24/7. Anything can be done with more than one way. And so is WMM to MP4 conversion. Some users prefer versatile software to change MSWMM file to MP4; others adore the online free site to reach their goals. If you are the one who favors the latter one, you're suggested to consider the easy-to-use yet fast online video site- online-convert.com. The reasons that I recommend it lie in its powerful conversion ability and easy manipulation. To be specific, it enables you to free convert Windows Movie Maker to MP4 format with purely 4 mouse clicks. No matter what kind of skill level you are in, you can discern how it works immediately without any guide or support. Step 1: Open Windows Movie Maker to MP4 online converter page, http://www.online-convert.com/. Go to Video converter, choose "Convert to MP4" from the drop-up menu. Step 2: On the video to MP4 page, click "Browse" and choose Windows Movie Maker file. Step 3: You can do video settings on the Optional settings section before you do the Windows Movie Maker WMV/WLMP/AVI etc. to MP4 conversion online for free. Step 4: Click "Convert File" and the online website will start to upload your file. It will take a long time to finshed the online WMM to MP4 conversion. It takes long time to decode Windows Movie Maker files to MP4 format free online, from file uploading to queue and processing. Online programs are filled with ads and spyware. The maximum file size you can convert is only 100MB. If your file are larger than this, you have to pay to upgrade to premium service. Trust me, most online tool is brimming with tricks inside. Outdated design, unfriendly user interface, lack support. Step 1: Open the WLMP file and you will see the Movie maker window. Step 2: Click export movie option at the top right corner. Here will appear a long list of the output devices and resolutions from the drop-down box. Step 3: Opt for the output device (resolution) you need. Afterwards, the process will commence and it takes a couple of minutes. Then you'll be prompted to play the video or view the folder in which it is located. Is it helpful? If it's helpful, you can share this experience with your friends or to Facebook, Twitter, etc. If not, just try the mentioned free video converter software at the very begining. And you're warmly welcomed to make a comment below or E-mail us if you find even better solutions to easily and fast convert WLMP to MP4. We'll be glad to refer to your methods. Free convert any video to over 180 video formats and 14 popular audio formats, let alone Windows Movie Maker video to MP4. What's more, it can even further edit your video, like trim/crop video, add SRT subtitles to video, rotate video and ajust video parameters to compress video to smaller size. How to decode MP4 AVI WMV MOV with Mac video decoder.